Hello the cocoa is 84 years from the bottom of abril 1933 to 330 , what do you think ? zone 1620/50 for bottom? Never analysed Coco before, seems like fan. Please be gentle this is my first cap of coco. “My first cap of cocoa”. Pun intended? It depends how good the model is. I am watching NIB closely. It has had one failed rally so far this year. If it rallies strongly again it will be a double bottom after a long drop. What are the nominal cycle periods you are using? It looks like the green cycles are 9y. So purple is 18y and blue is 36y? Actual average appears to be somewhat less. So we are cresting near the peak of the 9 year cycle, expect further downward action, and feeling the rising action of the 18y, as the 36y begins to turn down, or is it right-shifted and will not begin its downward trajectory for a few years yet? Ruffly 36, 18, 9. Data going back to 1966 not enough for the long term analysis. There is much commonality in the agricultural commodities, who seem to be making lows. This is well spotted and well-timed I believe. I am long NIB from 22.00 and happy to wait patiently for the breakout. Patience in this trade has paid off. I would be interested to have your thoughts on the future of this commodity. I anticipate a local peak in the coming days, if it has not already peaked. I also expect that it will have a bright future in the summer of next year with a nest of highs including the 18 month peak. However before that it looks set to languish back to its springtime lows or possibly worse, with the coming 20 week trough. My analysis for Cocoa did not change. When I get the chance I will look at the daily time frame. 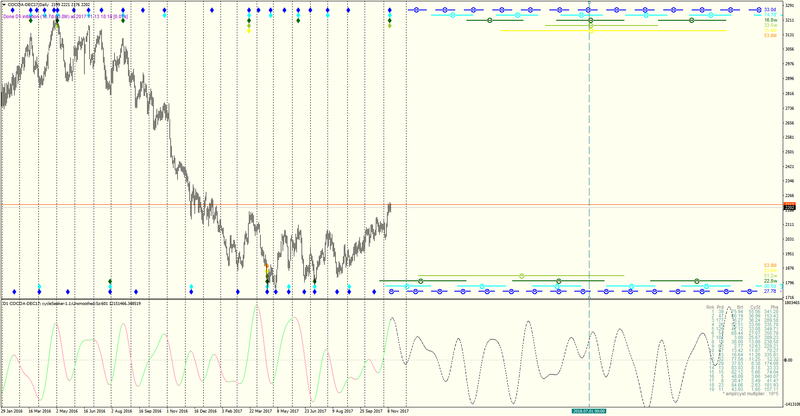 Weekly chart is on target but price is lagging behind time. And the time is ready for a minor pullback. Daily about to pull back. And lagging model looks stable. I think, I am starting to like Cocoa. 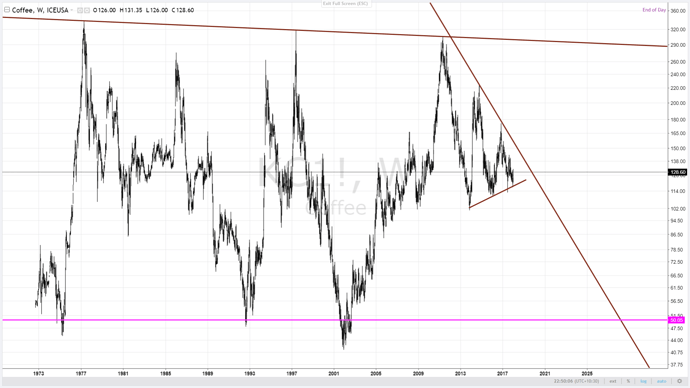 What would you say about Coffee price? The market is awaiting fundamental decision (has been awaiting since 2011). Brasilian “Moster Crop” is expected in February. $40 - that would be sweet !!! I have no access to data download for KC1, pity. 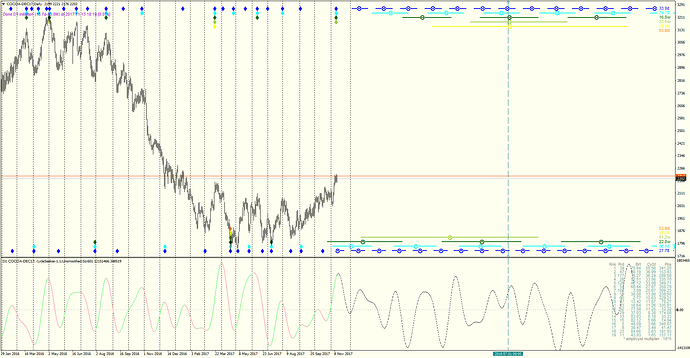 If Dec low holds next 40 day cycle low (Feb) can be played to upside. Weekly picture is mixed Feb should provide more clarity support is 1758 and must to hold. So far so good and model seems stable.